What Happens if You Get Caught Transporting Moonshine in Tennessee? Moonshine is a high-proof distilled spirit, which is usually an unaged whiskey produced with corn and sugar. The production of moonshine is typically illegal because those who produce it do not pay excise tax. While Tennessee has recently permitted limited legal production of moonshine, transporting moonshine without a permit within Tennessee is still against the law. If you have been caught transporting moonshine in Tennessee, you may be subject to criminal and civil penalties. If you are caught transporting moonshine, you may be charged with the illegal possession of an alcoholic beverage. 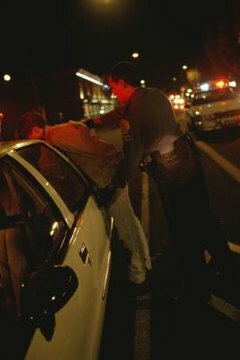 Tennessee Code section 39-17-703 specifically prohibits the possession of intoxicating liquor for which all taxes have not been paid. The possession of moonshine is punishable as a Class A misdemeanor which, as of January 2014, carries a maximum sentence of 11 months and 29 days in jail and a fine of $2,500. If caught transporting moonshine, you may also be charged with the transportation of an untaxed alcoholic beverage. Tennessee Code section 57-3-401 prohibits the transportation of more than five gallons of an untaxed alcoholic beverage, and breaking this law is punishable as a Class E felony. As of January 2014, this crime carries a sentence of between one year and six years, as well as a maximum fine of $3,000. If the county where you have been caught transporting moonshine is a dry county, you may also be charged with unlawful possession of alcohol. A dry county is a county that does not permit the possession of any alcohol, taxed or not. As of January 2014, 26 of the 95 counties in Tennessee are dry counties. Possession of alcohol in a dry county is a municipal offense, punishable by a fine of between $50 and $100, as of January 2014. Each container of alcohol is considered a separate offense. Any individual convicted of illegal possession of an alcoholic beverage or transportation of an untaxed alcoholic beverage may also be subject to seizure of property. Under Tennessee law, the Tennessee Alcoholic Beverage Commission retains the right to seize and auction off illegally transported moonshine. Additionally, if you are caught illegally transporting moonshine in a motor vehicle, the TABC may also seize and auction your vehicle. The proceeds of any such auction are paid into the state treasury. Jackson, Salvatore. "What Happens if You Get Caught Transporting Moonshine in Tennessee?" , https://legalbeagle.com/12328448-happens-caught-transporting-moonshine-tennessee.html. Accessed 20 April 2019.